Everyone mourning the loss of a loved one will be comforted by this lovely array of red roses, red gladioli, and white mums. A beautiful choice for the memorial service. 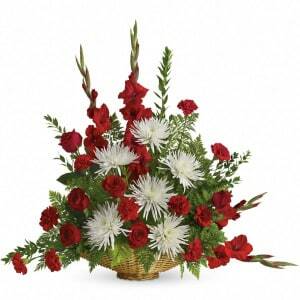 • This radiant bouquet includes red roses, red gladioli, red carnations, white spider chrysanthemums, and accented with assorted greenery. • An appropriate gift to send from a family member, friend, or business associate. 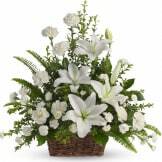 • Delivered directly to the funeral home or the family residence. 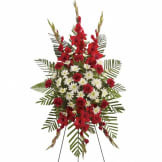 • Measures approximately 36" W X 31" H.
Flowers will be received by a Temples-Halloran Funeral & Cremation Services' staff. This arrangement was delivered on time and our friends who were there said it was absolutely beautiful. I would recommend this arrangement. Wonderful, professional service. Very caring and their attention to details is superb. Highly recommend. We were very satisfied with our purchase and pleased that you got them there on time. we ordered the night before the service and you delivered right before it started. Thanks so much! The enduring flowers were beautiful. They were bigger than we thought from the picture and just the perfect size. Very satisfied! On Monday, we ordered this arrangement because of the glads. The following morning, the Sympathy Store called. They said there were no glads available and other cost-comparable flowers would be substituted. 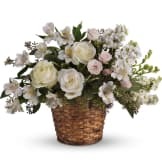 When I expressed my frustration that the whole reason we selected this arrangement was because of the glads, the employee mentioned that the flower delivery truck doesn't arrive until Friday and there was nothing they could do about it. We still don't know what flowers were substituted or how the arrangement looked since we were unable to attend the viewing and funeral. The arrangement arrived looking just like the picture. Beautiful and healthy flowers. Great value, Beautiful arrangement, will use over and over again! Easy to order and great service! The floral arrangement was beautiful. Thank you so very much. This was exactly what I had expected-beautiful!